Now that CNet has broken the story, I can talk about what I've been working on for the last 6 months. I'm the designer (there will be two of us shortly, which is good because my head is about to expode) at a company called Slide. Slide is a company focused on the idea of personal broadcasting. With Slide, you subscribe to the people and content that you care about, and publish content for other people to subscribe to. By subscribing to content, it is delivered to you automatically. When someone adds photos or a link to a website, you get it directly, without having to constantly check a website to see if there's anything new. Those in the blog community are very familiar with this. We use tools like Bloglines and Newsgator to subscribe to the blogs that we read regularly. As I've mentioned before, I believe that this idea of subscriptions is the third big wave in the evolution of the web (hyperlinking was the first, search was the second), which is why I was so excited to jump in. Those more technical understand that this is all powered by a variety of technologies (many of which I discussed in "The Syndication Mess") and will learn quickly that Slide can build channels using RSS 2.0 feeds as well as content from your local machine. But the nice thing is that if you don't understand what I just said, it doesn't matter. The goal is to try and simplify the entire process so that grandma doesn't have to worry about XML, RSS and a bunch of other acronyms. She can just subscribe to Johnnie's photos and they will stream by, and new ones come through automatically. The details around whether those photos come from a Flickr RSS feed, from my laptop, whether they're pushed using RSS 2.0 or Atom or going over 443 vs. 80 should be completely transparent to her. It should just work. In addition to the idea of exploring subscriptions and personal publishing, I've also been interested in working on a connected client-application for a while now, especially when reading articles by people much smarter than I am on the subject. Google and Yahoo! are getting more involved in the area of connected client-applications as well, which is, I believe, the right progression (for an over-the-top assessment, read Kottke's take). Slide is currently in private beta, but will open to the public on Monday. If you can't wait that long, let me know and I will invite you. Oh, and one last thing: Right now Slide is Windows only (doh!) but we're building out our Mac dev group, so contact me if that is something you'd be interested in working on. I'd love to get my hands on Slide and give it a whirl! I'm not sure I understood this correctly. Can you create a subscription to photos that reside on your computer without needing a website? I would like to get an invite and check out Slide. It sounds really interesting. Congratulations for your work and could you please send me an invitation. 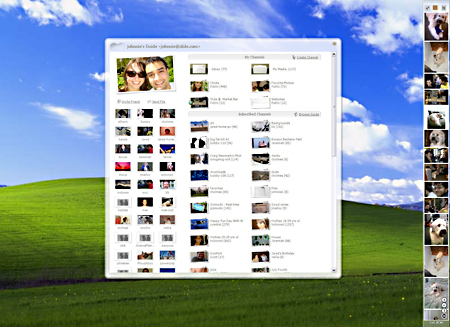 Jeff, with Slide photos and other media from your desktop can be "pushed" to others without the need for a website. It will be delivered directly to their desktop, and updated content will appear automatically. The files are uploaded in the background and we take care of the rest.